Today was Waitangi Day in New Zealand, so that means a day off work. It was a gorgeous sunny day so we made the most of it and went on a picnic. 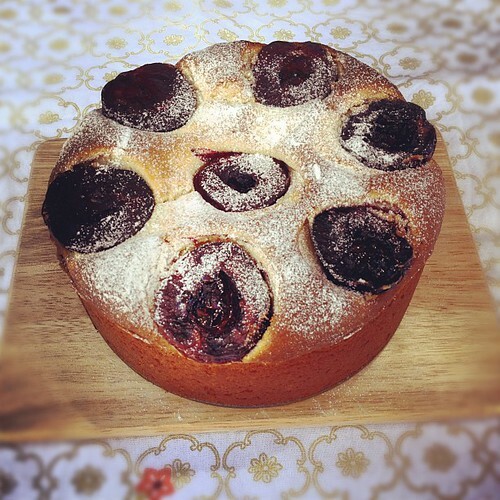 It is Black Doris plum season at the moment too, so I made a yummy sour cream plum cake to make the most of these delicious plums. 1. Preheat oven to 180 degrees. Cream the butter and sugar together well. Beat in the eggs one at a time and and add the essence. 2. Sift the flour and baking powder and add the almonds and sour cream, then gently fold everything together. 3. Spoon the mixture into a greased 20cm cake tin or French paper mould. 4. Place plum halves on top, cut side up. The number of plums depends on their size – they need to be close but not overlap. Sprinkle the sugar and ginger mix on top if using. 5. Bake for 50 minutes. Cool a little, then remove from the tin and dust with icing sugar. Note: My cake was still uncooked in the middle at the 50 minute mark, so I ended up cooking for about 1 hour and 5 minutes. The recipe says you can substitute for any stone fruit, rhubarb and I can’t wait to try this out when it’s feijoa season in a month or so!